Lucy grew up in the English countryside, spending every available moment finding adventures in the surrounding fields and woodland. Lucy took her first trip to South Africa when she was 19, where she volunteered on a game reserve in the Eastern Cape. There she experienced wildlife she had only ever dreamed about in the most incredible of encounters, and it was here that her passion for wildlife conservation was realized. Lucy went on to study bio-veterinary sciences at university, covering animal behavior among other subjects. 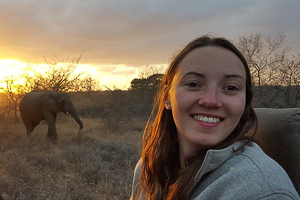 At the same time as studying in London, Lucy used her summer holidays to travel again to South Africa and undertake her field guide training where she became a back up trails guide. Lucy learned to appreciate all of the finer things the bush has to offer, finding a particular love of birding and photography. It was during this field guide training that she met River Degenaar, now head guide at Outdoor Africa. The two have always been an excellent team, sharing their knowledge and their passion for teaching about conservation. Lucy uses her knowledge of animal behavior to compliment walking in the bush and enjoys learning something new every time. She is constantly awed by the majesty of the bush and all its inhabitants. She believes that when people are fully immersed in the bush they can’t help but fall in love with it and she hopes to give people this opportunity. Lucy is based in London, UK and is our lead safari coordinator in the region.